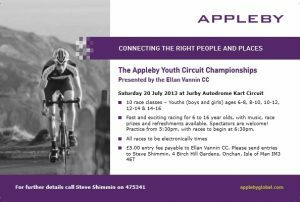 The ride will be followed by a presentation and chip bap plus tea etc. Sorry again but with food involved we had to make a decision sooner rather than later and hope it pours down. Please find attached the results from last week’s event which was held in perfect conditions yet again! The various handicap Groups were timed to come together early to give everyone the chance of experiencing the sensation of riding within a large peloton. All the groups came together on lap three. I’m not sure this experiment worked out too well and I will be ‘stretching’ the handicaps again at the next event. Despite attempts by the scratch riders to break up the bunch a large group of over 30 riders managed to stay together to contest the finale. Hesitation by the bunch in the final mile or so led to some nervous riding, however the sprint was eventually led out and won by in form Leon Mazzone (TMT) from hard charging RL360 youngsters Owen Dudley and Nathan Draper. Group ‘mentor’ Marty Warren (Fiesten Tempo/ Ellan Vannin) held on to 4th from a fast finishing Elliot Moore (MVW) who again confirmed his superiority in the sprint over Team Pie Leader Martin Hall in 6th despite the latter making some high tech adjustments to the positioning of his timing chip in an effort to squeeze a ‘marginal gain’. First lady home was Natalie Arrowsmith (TMT) with ‘new found’ confidence after a solid Island Games performance followed by the (to be) newly crowned UK Junior Champ Anna Christian (Team Scott Contessa), Laura Morgan (MVW), Phoebe Ferguson (RL360) and Sophie Black (MVW) making her first appearance in Senior competition. A new lap record was established by RL 360 fast man Matthew Bostock at 13 min 18.924 seconds. I don’t expect this to stand until the end of the season but it’s great to see the youngsters leading the charge. Thanks to all the usual officials, drivers and marshals. Big thanks to Bikestyle for making the event possible. The next round is Thursday 1st August. As this will be the 4th round, Series Positions will be released with the results (4 rounds to count toward series result). Marshals for this round are Jordan Barry, Mark Blair, Les Corran, Guy Hatton, Jason Malone, Elliot Moore, Simon Quirk & Marty Warren. Please excuse delay with the last round of the Conister Bank T.T. Series last event. 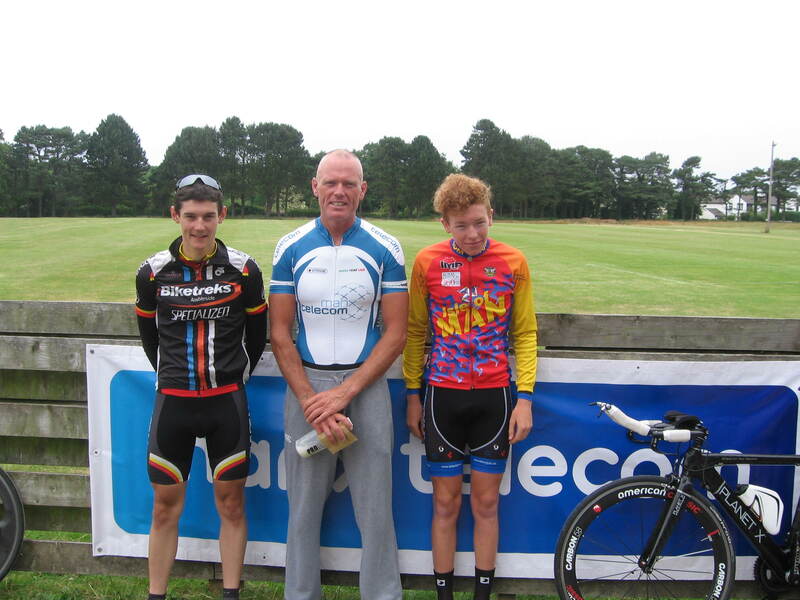 The podium from this morning’s race L to R Jonathan Cregeen(3rd), Gary Johnson(1st), Matthew Bostock(2nd). Results from Manx Telecom sponsored “25” Mile Time Trial. The course was changed from the Ballaugh 25 to the Bride circuit because of roadworks on the Ballaugh/Wildlife stretch of the T.T. Course. The race, if not tough enough with two climbs of Bride hill, was run in windy conditions, but at least it was a fine morning. The Club is hosting this new Event this year and I’m looking for some volunteers to simply act as ‘Stewards’. The circuit is completely closed so there are no traffic issues I merely need people to provide a presence and be visible to the children so that if they have a problem or fall off someone will be close to hand. If you can spend a couple of hours on Saturday evening please let me know. Additionally if you can pass this note on to other Club members that would be great. Just a note to encourage everyone to enter this event. It’s always a great night with lots of teams of mixed ability. Get your entries in asap it fills up fast. The sign on sheet is in Bikestyle now. Please find attached results from last night’s Conister Bank sponsored Time Trial Series Event 13 Just one more to go. The provisional Results attached, if anyone feels they have been misplaced give me a shout. It won’t make any difference though! Fantastic race tonight well done, the finale was a great spectacle. Perfect weather conditions greeted the 52 starters to Bikestyle Handicap Series Event 2. Yes I did say perfect weather conditions at Jurby!!! RL360 youngster Matt Draper stole the show braking away from a fast moving large group on the final lap and hung on to win by 3 seconds. This guy has got a really good engine. The handicapper noticed his exploits and he will be deservedly moved into a faster group as a reward for his efforts………. with subsequently reduced chances of winning again this year! Elliot Moore (Manx Viking Wheelers) pipped Martin Hall (Team Pie Pro Cycling) by 0.001 sec for second position. Hall made a strong protest to the race jury questioning the positioning of Moore’s timing chip, suggesting that Moore had gained an unfair advantage by moving his timing transponder as close as he could to the bottom bracket whilst Hall had his positioned close to the rear drop out. The protest was instantly dismissed by the Chief Judge who told Hall to “man up and take defeat with grace and dignity instead of pitifully whinging”. A further suggestion that fewer pies would lead to faster finishing was not well received by Hall. An additional suggestion from the Judge that he should pay more attention to ‘marginal gains’ was not received well and the Judge had to make a fast exit from the scene to avoid placement of a timing chip in a da place where the sun never shines!. The truth hurts sometimes! Wily Pete Gage (Team Manx Telecom) sneaked a well-deserved fourth from fast finishing Andy Brooks (Manx Viking Wheelers). Mark my words these guys will be in the hunt for overall honours at the end of the series. Conor Davies (RL 360) had a great ride to finish 9th. Another youngster on the way up the ladder! Laura Wasley (Team Scott Contessa Epic Manx Viking Wheelers ) was first lady across the line 6.3 seconds down on the winner. That team name doesn’t roll of the tongue does it? Welcome to Laura Morgan who finished strongly, competing for the first time on the Isle of Man. The top 26 riders were covered by 7.7 seconds. Despite the start times of the groups being shortened considerably the scratch Group still failed to make contact with the main bunch. This shows how the strength and work rate of the ‘main field’ is improving. The scratch guys will be moved considerably closer at the next Event on 25th July and should be able to contest the finale. Thanks as usual to Jerry Jones (St John Ambulance), Ja Cockram, (Lead Car), Rich Cuffwright, (Bikestyle Motorcycle Safety Officer) and the marshals stood down from race duty. Also to Graham Hughes and the team at Manx Timing Solutions. Coaching and mentoring was provided by Rob Holden and Rob Dooley, this feature is definitely helping the less experienced riders settle in to road racing. Once again thanks to all for entering, it was a great race and thanks to Bikestyle for making it all possible. We are working on a date for the Gala Presentation Evening…watch this space. Below is a link to the results from yesterday’s Conister Bank sponsored T.T. League Event 12 of 14. Thanks to manxtimingsolutions.com for these results. Attached are the results from round 11 of the Conister Bank sponsored T.T. Series.